Hear Big Ben's famous "bongs" ring out at midnight on New Year's Eve in London, followed by the UK's largest annual fireworks display over the Coca-Cola London Eye, presented by the Mayor of London. The hugely popular London's New Year's Eve fireworks have been ticketed since 2014 to ensure the event stays safe and fun for all. 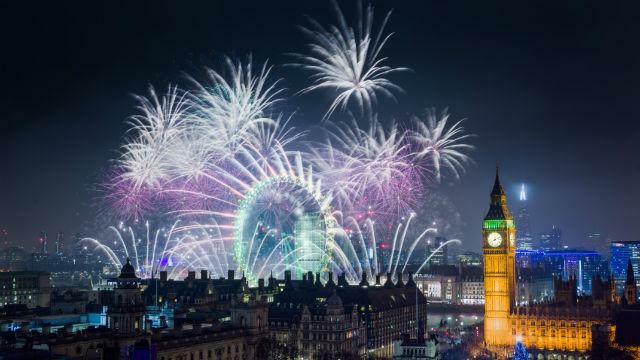 The Mayor of London's New Year’s Eve fireworks tickets usually go on sale in September. If you want to join in the celebrations on the night, you must have secured a ticket in order to attend. If you have a ticket, remember to pack light and bring essential items only – no backpacks or suitcases are allowed at the event. There are plenty of other things to do in London on New Year's Eve 2019, including more ways to see the fireworks: watch the famous London display from the river on a NYE fireworks cruise, celebrate at one of the many New Year’s Eve club nights, or see the capital light up at midnight with a New Year’s Eve meal in a top London restaurant with a view. If you're not attending the New Year's Eve fireworks 2019 in London, you don't have to miss out: you can see the spectacular display live on BBC One. See last year's New Year's fireworks display in the video below. Central London will be very busy so plan ahead and use public transport to get around. Plan your journey in advance and check the Transport for London website before you travel into central London.